Oil to Gas Conversion - T.Webber Plumbing, Heating, Air & Electric. The Hudson Valley’s cold winter temperatures necessitate near constant use of one’s heating system. It’s no wonder that residents are constantly looking for ways to easily and affordably heat their home while having the lowest environmental impact. Nationwide, only about 8% of homes are heated with oil. More common is natural gas (approximately 50%), electricity (34%) and even less common is propane (6%). The vast majority of oil-burners are concentrated right here in the Northeast where they account for 31% of residential heating systems. That’s largely because of the region’s proximity to the ports where oil barges deliver their loads and the fact that oil was a cheaper option back when many homes were built. You’ll notice than many older homes throughout the Hudson Valley are oil-based, while newer developments tend to be gas-based. If you’re a Hudson Valley homeowner contemplating making the switch to natural gas – consider T.Webber for your conversion project. 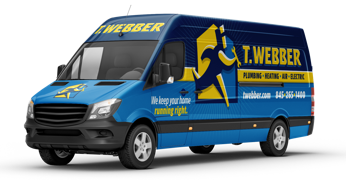 T.Webber’s professional installation team will walk you through the daunting conversion process, assist you in pulling any necessary permits, work with your utility company, and make your transition as easy and pain-free as possible. Convenience. Switching to natural gas means never having to worry about running out of oil. Since it’s delivered to your home via piping directly from the provider, you will never run out or risk not having it when you need it. Besides heating your home, natural gas can be used for a variety of household appliances, including your hot water heater, swimming pool heater, clothes dryer, fire place or stove. With a gas conversion you can consider updating your dated old kitchen with a new gas range – or adding an outdoor kitchen with a built in gas grill! Reduced Environmental Impact.Because gas is cleaner burning than oil, using it to heat has less impact on the environment. This also means that you will never have to remove oil or ash from your heating system’s interior ever again. Increased Home Value. Switching from oil to gas has an instant impact on your home’s value. If you’re looking for ways to add equity to your home, switching to a natural gas heating system is a good place to start. To learn more about making the switch from oil to gas heating, call T.Webber today. We offer complimentary consultations on oil to gas conversions. You can trust T.Webber to educate you as to the pros and cons of each option to ensure you are able to make an informed decision for your home and family. For expert advice, call T.Webber.